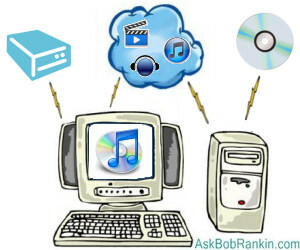 When iTunes v10.4 debuted in July, 2011, it omitted a feature that many users had come to depend upon: “Back Up to Disc,” which let you make a full or incremental backup of an iTunes library to CD or DVD. But let not your heart be troubled... there are other ways to get the job done. iTunes in The Cloud is dead simple, but it serves as a backup only for content that you purchased from the iTunes Store, and not even all of that purchased content. You can re-download past purchases to your iPod, iPad, iPod Touch, or computer (Mac or Windows) using iTunes 10.3 or later. In most countries, you can re-download music, apps and books; U. S. users can also retrieve purchased TV shows. But movies, audiobooks, podcasts, and other types of media may not be available to re-download. Very old items may be removed from the iTunes Store, and you won’t be able to re-download them. iTunes Match is a subscription cloud service that will store your uploaded music, including music that you did not purchase from Apple. But it stores only music, so it’s useless as a backup for videos, books, or any other type of content. It also converts all uploads to 256 kbps ACC files, which may not be an improvement. For iTunes 10.4 users, Apple suggests just one method to make a local iTunes backup. It involves consolidating your iTunes library into the iTunes folder, then copying the iTunes folder to an external hard drive. “Restore” is just another word for crudely copying the backup iTunes folder onto your hard drive; there is no provision for restoring individual files in that folder. Forget incremental backups. And don’t forget to delete the duplicate files that this method leaves scattered all over the place. Time Machine is Apple’s built-in backup/restore utility for Mac OS X 10.6, OS X Lion, and OS X Mountain Lion. It's general purpose, so it can backup everything, including iTunes files, to an external hard drive. It can restore individual files or folders. It can even restore files or folders as they were on specific dates. But of course that only helps if you're on a Mac. A general backup strategy for iTunes collections should start with knowing where all of your iTunes files are. Within iTunes’ Advanced Preferences, there is a checkbox labeled “Copy files to iTunes Media folder when adding to library.” Enabling this option ensures that all your iTunes files are in that folder at all times; but it does result in duplication of files. By taking note of the name of the iTunes Media folder which is displayed on the Advanced tab, you can point your backup program there, and have it do full or incremental backups on a schedule that you choose. There are many good backup/restore programs that can keep your iTunes library safely backed up on local or online storage. See my article, Free Backup Software, for Mac and Windows recommendations. Online storage services can also handle iTunes libraries, but their free storage space allowances may be too small for iTunes fans with extensive music or movie collections. And you'll need a speedy Internet connection to transfer multiple gigabytes back and forth from your hard drive to the online storage service. See Free Online Storage for an overview of several online storage options. Most recent comments on "How to Backup iTunes"
My car still plays CDs, so I always burn a CD for every new album I purchase. I also have iTunes in my general backup process. I just copy my iTunes folder to my external hard drive. I still don't know why Apple removed the option to back up the music library to CD. On second thought, my music library is so large that iTunes needed 16 DVDs to back everything up, so it's definitely easier to just copy everything to an external hard drive. I don't have any strategy on this but I would appreciate a backup strategy for an IPhone. I have an older model that recently crashed. I lost all the apps I had that no longer have releases that work on my version of IOs. I would like to know how to save my itunes from the iPod to my hard drive. I didn't realize i could only sync my iPod to 5 devices, having 2 laptops that have each been wiped and reinstalled 2-3 times my ipod now thinks I've synced to 5 different devices and I can no longer sync from IPod to laptop. On a totally different note, I managed to upload my music library to Google music, including my iTunes library. It allows, I think, up to 20,000 songs. You don't need a different backup strategy for each type of collection on your computer. You do not need one strategy for iTunes, and another for your photo library, a different strategy for your documents, and still another for your Quicken or other financial files. One simple, comprehensive strategy is all you need! You should be backing up ALL your data. Regularly. I use GoodSync (from the makers of RoboForm) to back up to an external hard drive. This allows quick and easy retrieval for the occasional need. Then I use Carbonite to back up to the cloud. This protects against fire, flood, hard drive failure, and other physical disasters. Be sure, with any backup program that you use, that you know where your data is stored. Most programs today (Quicken, for example) now allow you to specify a destination for your files. Then make sure your backup program "knows" about that location. Carbonite, for example, allows you to add locations in addition to its default backup targets. On another note, how can I download the music on my iPhone to a new computer? My old computer, to which it was previously synched, died. EDITOR'S NOTE: Why can't you just sync the iPhone to the new computer with iTunes?